Saipov's attorney said seeking death instead of accepting a plea for a life sentence "will only prolong the trauma of these events for everyone involved." 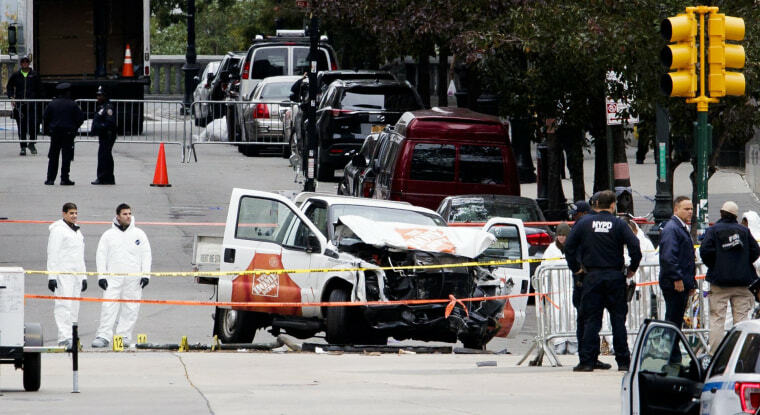 NEW YORK — A man charged with using a truck to kill eight people last year on a New York City bike path will face the death penalty at a trial next year, federal prosecutors said Friday in a case where President Donald Trump has tweeted that the defendant deserves to be executed. The government filing said the case against Sayfullo Saipov met several legal standards for a capital case, including premeditation to commit terrorism and the "heinous, cruel and depraved manner" in which the victims were killed. "We think the decision to seek the death penalty rather than accepting a guilty plea to life in prison with no possibility of release will only prolong the trauma of these events for everyone involved," Patten said. After Saipov's arrest in the deadliest attack on New York City since Sept. 11, 2001, Trump tweeted, "SHOULD GET DEATH PENALTY" and "Should move fast. DEATH PENALTY." The tweets were cited in defense papers filed earlier this month that demanded an independent prosecutor make a decision, arguing that Sessions' tenuous relationship with Trump made it impossible for DOJ to be fair. Sessions "works for President Trump and obviously wants to keep his job," Saipov's federal public defenders wrote. "It defies reality, not to mention all appearances, to believe that he could make a truly independent decision as to whether Mr. Saipov should face the death penalty, knowing that a decision not to seek death would inevitably trigger a 'tweetstorm' of ridicule and scorn from the President and might well lead to the loss of his job." In a separate filing on Friday, prosecutors said the argument "strains credulity" because there was no evidence that the decision was influenced by politics. "After fully complying with the law and Justice Manual, the attorney general appropriately exercised his discretion in determining that the circumstances of this case - which involve a terrorist attack that caused extensive death and human suffering - justify the ultimate sanction available," prosecutors wrote. Court papers say that after his arrest, he told the authorities that he was inspired by ISIS videos, and that he had used a truck in the attack to inflict maximum damage against civilians. He's pleaded not guilty.